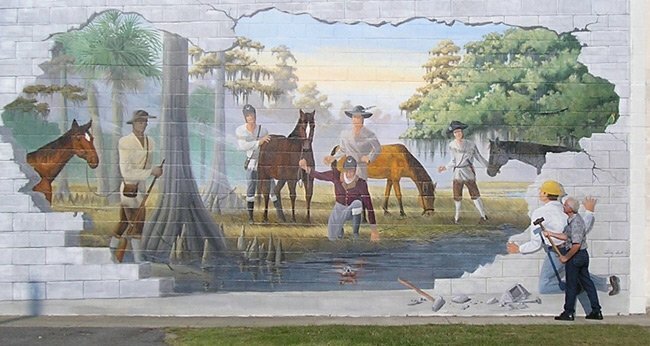 The Swamp Fox Murals Trail Society donates murals across Clarendon County. Most honor General Francis Marion, who fought valiantly in Revolutionary War battles throughout the area and across South Carolina. General Marion was known as the “Swamp Fox” for his brilliant guerrilla warfare and surprise attacks. The “Reflections” mural, shown above, features General Marion and the men of his brigade pushing back the British forces in the Black and Santee River basins. Located on North Mill Street, the mural is one of 17 – so far! – across Clarendon County, and it was painted by Terry Smith of Land O’ Lakes, Florida, in June, 2011. Update: Along with the Santee Indian Mounds, the Clarendon Murals are now highlighted in a walking tour app you can download for free.